The 1997 fire at the Delaware Trust building was a wake-up call. Firefighters were confused about who was in charge and struggled to coordinate during the high-rise blaze that injured 15 of them at what is now the Residences at Rodney Square, federal investigators said in a report two years later. The feds recommended additional training. They said Wilmington should utilize nearby training facilities, conduct exercises with county companies and “evaluate their in-service training program to ensure that it is adequately preparing fire fighters to respond to various incidents,” the report said. Nearly two decades later, the department wasn’t so lucky. A blaze on Sept. 24, 2016, in Canby Park took the lives of three Wilmington firefighters: Christopher Leach, Jerry Fickes and Ardythe Hope. A lack of training for firefighters and officers was cited among the factors that turned the fire fatal, federal investigators said in a November report. The Wilmington Fire Department increased the quality and frequency of training after the Canby Park fire, firefighters said. But the two federal reports raise questions about why the changes didn’t happen sooner. Even after a near catastrophe in 1997 and federal recommendations in 1999, the Wilmington Fire Department did not embark on a consistent effort to properly train its personnel until three firefighters died. “How do you defend that?” asked Bill Kirlin Jr., a retired Wilmington firefighter who was among the first responders at the Delaware Trust Building. Most of Wilmington Fire Department’s training before and after the Delaware Trust fire was “company level” training, in which firefighters learn from their officers, Kirlin said. The officers may or may not have nationally certified credentials because outside continuing education is not required. The most recent federal report states that “instructor” and “officer” classes should be offered “on a rotating basis” but Wilmington has offered them rarely, if ever, said Joe Leonetti, the fire union president. Live burn training is supposed to occur at least once a year, according to the federal report on the 2016 fire, but Leonetti estimated Wilmington has done them only three times in five or six years. There’s a significant difference between learning from an uncertified company officer and one certified by the Pro Board, the professional organization that trains instructors in national standards, according to Kirlin. “It would be like a Cadillac compared to a Chevy,” he said. Firefighters must pass a written exam and physical agility test to graduate from the academy. One year later, Leonetti said they have to pass the physical test again. After that, Leonetti said training has been informal and/or optional. For firefighters who want to further their education beyond what the city offers, Leonetti said employees often have to go on their own time with their own money. Wilmington officials declined to be interviewed, citing a pending lawsuit involving the Canby Park fire. John Rago, Mayor Mike Purzycki’s spokesman, said in a statement that the fire department pays for training that is “required” or “approved” by the department. “If a firefighter requests training that is not required by the Department, and the Department approves the request, the Department will pay for the course but the firefighter must attend on his/her own time,” Rago said. Rago provided a list of training Wilmington firefighters do, including structural live burns, mayday training and how to fight below-grade fires such as basement fires. Since Fire Chief Michael Donohue took the helm months after the Canby Park fire, firefighters said there are more quality training opportunities. The fire department said firefighters interested in receiving Pro Board training and certification were given the opportunity this past year. Fifty-five were certified in 2018 in the areas of rope rescue, confined space rescue and vehicle and advanced vehicle rescue. Why didn’t Wilmington invest in more training? The 1999 report should have dictated “major changes” within the fire department, but it did not, Kirlin said. The main reason for that is money, according to Al Huelsenbeck, a former deputy chief who retired in 2013. Huelsenbeck said that national training sessions aren’t a silver bullet. National training materials tend to be written for larger departments with optimal resources, he said. There is no standard firefighting training policy in Delaware, according to the state’s Volunteer Firefighters Association. Warren Jones, executive manager of the volunteer association, said most, if not all, volunteer companies send their people to the Delaware Fire School, where they are trained in various forms of firefighting. All require the basic class, like structural fire fighting and vehicle rescue, Jones said. After they complete those classes, they do periodic training in the individual fire companies. Greenville, South Carolina Fire Chief Stephen Kovalcik, who leads a department in a city with 3,000 fewer residents than Wilmington, said it’s essential that firefighters stay sharp. His firefighters get annual refresher training. Continuing education is especially important because firefighting evolves as building materials change and fires burn faster, Kovalcik said. But firefighting as a profession can be slow to adapt. “There is a saying in the fire service. It’s 200 years of tradition unimpeded by progress,” he said. Even in departments that have strong training programs and protocols, tragedies can happen, Kovalcik said. There is no such thing as a perfect fire response. How is fire training improving now? Since Chief Michael Donohue took over in January 2017, Leonetti said the department holds mandatory training sessions on a new topic every month. The department under Donohue is also offering opportunities for members to obtain national certifications which were not offered previously and is planning to offer training for officers. Leonetti believes those changes are a direct reaction to the Canby Park tragedy. “We’re getting more training now than we ever got,” Leonetti said, but added more needs to be done. Leonetti said the union is working with the city to establish physical standards for firefighters. Currently, annual medical exams, which include a cardiac stress test, are optional. He said all firefighters aren’t necessarily in great shape. Purzycki recently secured funding for exercise equipment for the fire department, Leonetti said. If the physicals become required, the union doesn’t want the system to be punitive. Longtime City Councilwoman Loretta Walsh, who chairs the council’s Public Safety Committee, declined to comment for this story. “The Wilmington Fire Department has continued to evolve its training protocols in order to ensure that all WFD firefighters are responsibly trained on an annual basis. Throughout the year, the WFD offers multiple training events for its firefighters at the company and platoon levels, as well as department wide. The pending litigation is a lawsuit filed by attorneys representing the estates of Leach, Fickes, Hope and three firefighters injured in the Canby Park fire. Filed in August, the suit argues that a Wilmington cost-saving policy led to conditions that resulted in the deadly blaze. The policy, which places a fire truck out of service to save on overtime expenses, was in place the morning of the Canby Park fire, which prevented more than 1,700 gallons of water from being doused on the house before the first floor collapsed, trapping firefighters, according to the lawsuit. The rolling bypasses practice started under former Wilmington Mayor James Baker and was continued by his successor, former Mayor Dennis P. Williams. It is still in use today. 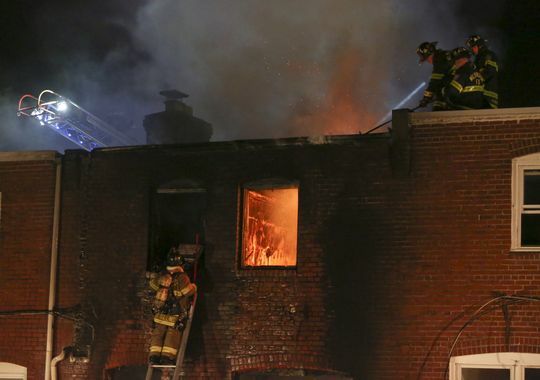 Thomas S. Neuberger, whose law firm and that of Jacobs & Crumpler represent the firefighters, said the federal report has shown the Wilmington Fire Department did not have a standard operating procedure when it came to attacking fires in basements, which are common in many city homes. “The city has failed to keep its firefighting skills up to date and this has cost it the lives of firefighters and others,” Neuberger said. Many Wilmington firefighters remain angry that Purzycki cut 16 firefighting positions from his budget during his first year in office. Besides concerns about slower response times and reduced manpower, Huelsenbeck said the loss of the positions makes it harder to train the people remaining. “Having the luxury of being able to put companies out of service to have viable training, that’s a big issue throughout the fire service,” he said. Sometimes it’s as low as 30, according to Leonetti. Kirlin said the department should continue to bolster training for all personnel despite the cost. Contact Christina Jedra at [email protected], (302) 324-2837 or on Twitter @ChristinaJedra.